Here is a standard 3-3 stack defensive alignment. 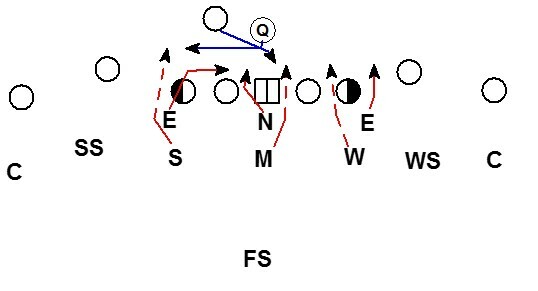 To complement the base three man line concept the defense can walk up a linebacker to create a four man front concept. On a South call the Sam walks up on the line of scrimmage. 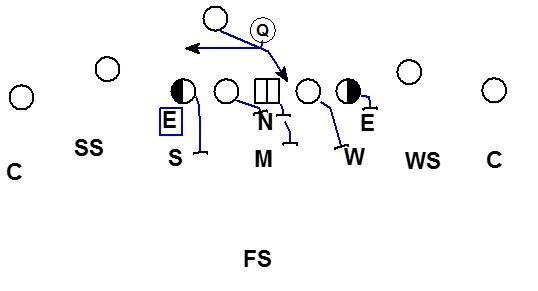 The End reduces to a 3 technique (could also be a 4i). The Nose aligns in shade (could also be a 2i). The Mike and Will bump their alignments. 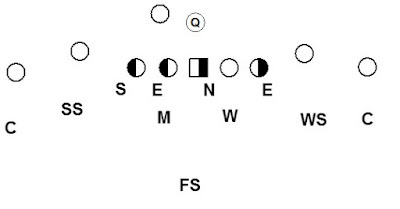 West is like South except the Will is the walked up linebacker and the front is bumped to the Will. It is easy enough to have words to change player's alignments. The challenge is creating continuity between the teaching and execution of the base stack front and the complimentary South and West fronts. Take for example a zone read run. 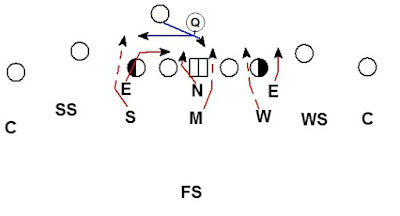 The offense is zoning to the defense's right and reading the left defensive end. 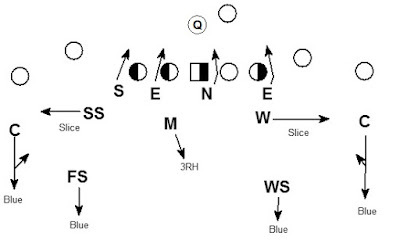 Here are the defense's run fits from the base stack front. Now look at how that base teaching matches up when the defense aligns in the South front. The major differences are the DE and Nose are lined up and controlling the gap they are aligned in at the snap. The Sam is still playing for the QB, the difference is only his alignment. Looking again at the base stack front fits. 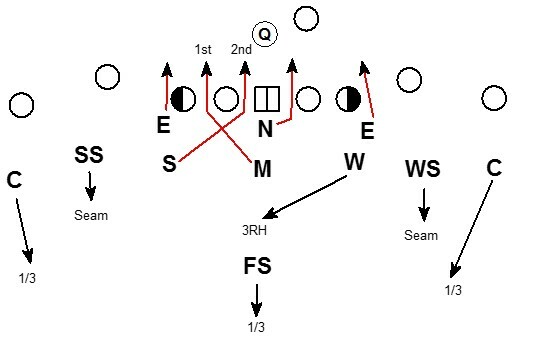 Here the zone is being run at the Sam while the Will is now to the side being read. The Will and right DE play the scrape exchange and the Sam and Mike fill their gaps. The fits change very little if the same run is called vs. the South front. 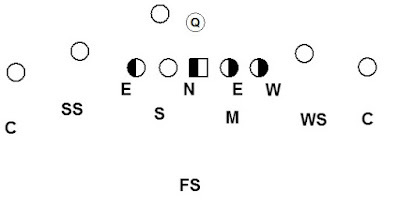 The defense again keeps the run fit virtually the same for the LB and DL. The adjustments are the alignments. 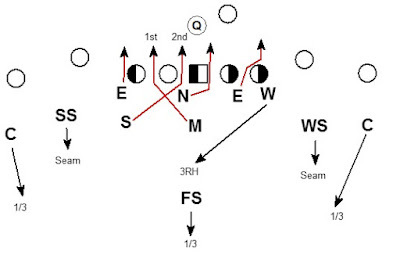 The other major change is the reduced DE is fitting the B gap and the Sam is fitting the C gap which is a role reversal from the base stack run fit. However, it is common sense for defenders to understand their new run fit is to control the gap they are aligned in pre-snap. 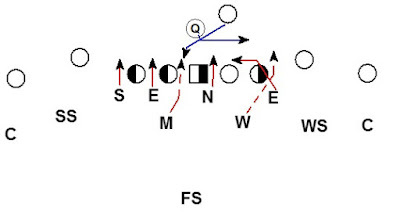 Using the South and West fronts can also create versatility for the pressure package. This same blitz can be translated to the the West front. The differences are again the alignments. The right DE needs to work to contain through the B gap. The Will drops into coverage from the LOS. 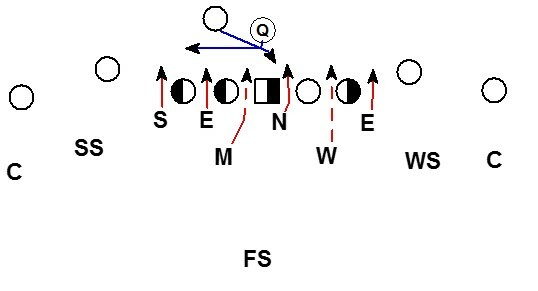 One advantage of using the West front for pressure is the ability of the defense to drop a LB, not a DL, into coverage. The Will already knows how to execute the pass drops so there is little new teaching. The defense also has flexibility to run concepts found in 4 man front defenses. 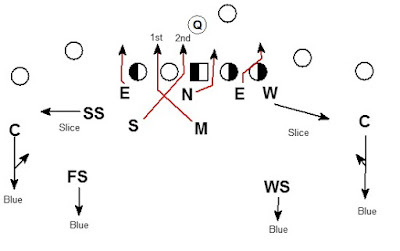 Here the defense aligns in the South front and runs TCU's Blue coverage. 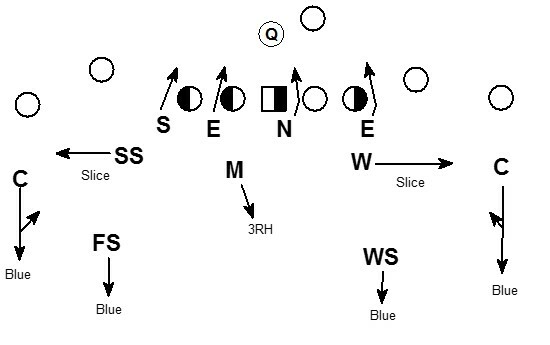 Blue is a 2 read concept. 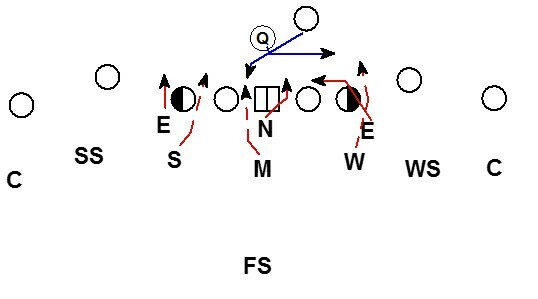 If this type of coverage is being taught it can also be run from the base 3 man line stack alignment. The versatility doesn't stop there. Elements of this coverage can be used in the pressure package. The blitz is Monster from the West front. 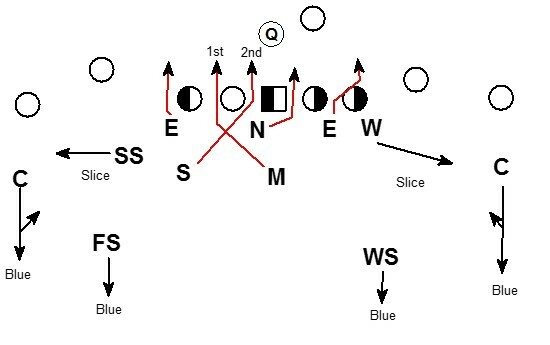 Against 2x2 the coverage is a Blue (2 read) coverage concept. If the defense is already teaching cover 3 and Blue these types of pressure coverages have a low investment cost. 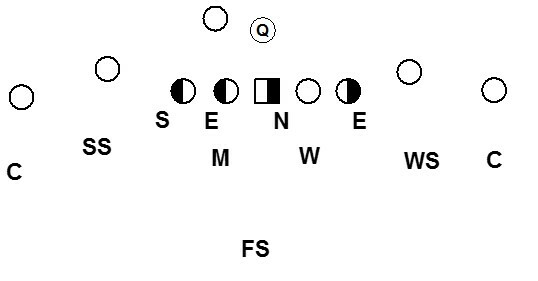 The players dropping in coverage are LB and DB. When the defense uses South/West to drop a player from the LOS it is a LB who practices the coverage every day. 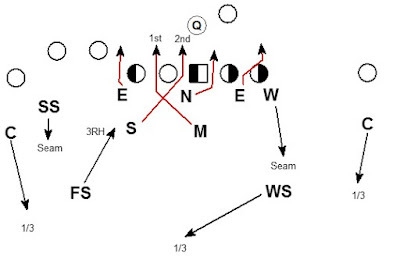 Concepts like South and West allow a 3-3 stack team to morph into a 4 man front. The best part is there is limited new teaching for the DL and LB. We do this out of our 3-4. We really like it vs 3x1 where #3 is the TE off the line. We basically align like a 4-2-5 from it.